The second Poster Monday spot of July takes us to London, England; home of the talented graphic designer Amelia Lupson. Amelia was born in Kent, England, and studied at the UCCA Epsom. She has does work for a creative agency called Distilled in London, and has been a designer and illustrator for 11 years. “I’m always keen to test out new illustration styles, so working on this series was really rewarding for me. I have always been fascinated by civil engineering, a passion that’s usually directed at dam photography” says Amelia. 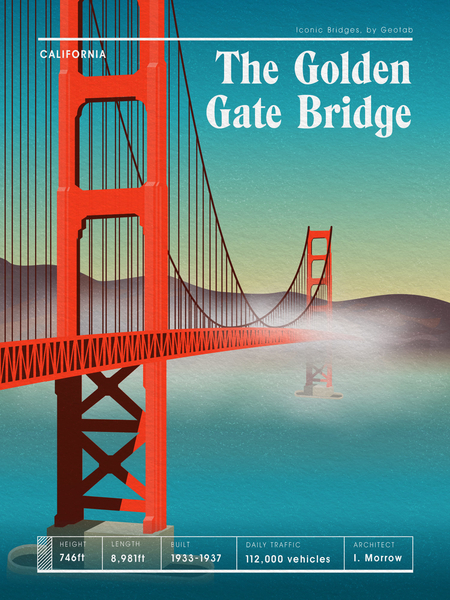 The “Golden Gate Bridge” poster was made for Geotab, the company is a connected transportation specialist, and this is one of a series of projects exploring the different ways people travel from place to place. Bridges are one of the most striking and visually appealing aspects of travelling by road in America. To celebrate this, they decided to showcase America’s 10 most iconic bridges. A poster series with a printed poster feel seemed the best way to present this, as it allows people to marvel at the architectural and engineering feats of each structure without ever having to leave their homes. Bridges play a crucial role in the USA’s infrastructure network, enabling transportation, trade and travel. The chosen bridges also connect and define how we see cities and states, often serving as destinations in themselves. This project pays homage to these iconic structures as well as the individuals whose hard work made their construction a reality. The poster series was illustrated by Leonie Wharton. The series can be accessed in full here, and you can view more of Amelia’s work at this page. Remember that all submissions are considered each week. If you would like to submit a poster to be featured on Poster Mondays find all the info you need in our submissions page, facebook and instagram.